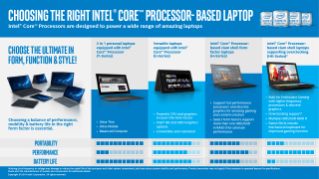 Intel® Core™ processor-based laptops are designed to power a wide range of usage models. Use this guide to see which fits your customers requirements for performance, mobility, and battery life. Speed up rendering time from minutes to seconds with Intel® Quick Sync Video.